My daughter Kaylee decided that she wanted to change it up this Halloween from being a cat (5 years out of 8 flr halloween lol) and Kaylee decided she wanted to be scary. very, VERY scary! So we went out and got oir supplies. Liquid latex, fake blood, gel blood, makeups, cosmetics, paints, and special effects wound prosthetics! I had never before tried liquid latex special effects before this, so i looked up some tips and tricks online for reference. My favorite part was doing kays hamd wound with exposed bones. We used Q-Tips as the bone part in the latex wound and used a paper mache technique to create the "peeled back skin effect" using bits and pieces of toilet paper in the liquid latex! When it dried we were able to peel back the latex skin and then apply the paint and gel blood as the much needed bloody gore. 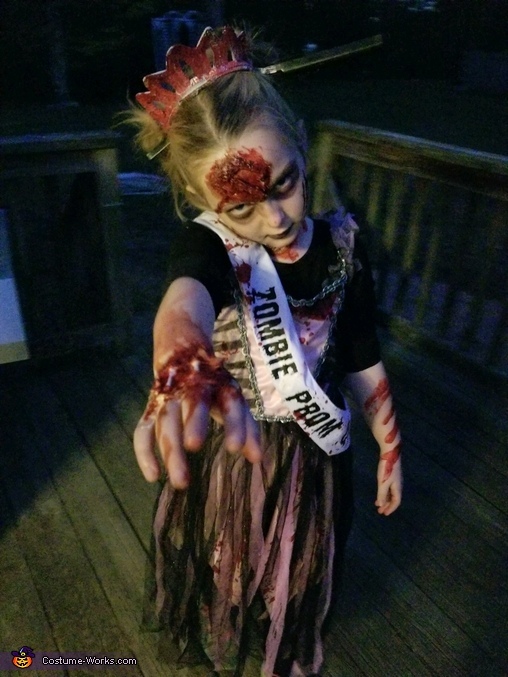 She practiced her zombie walk and zombie sound effects for an hour to scare her friends!